I finished another beetle today, it's a heliocopris from Thailand. 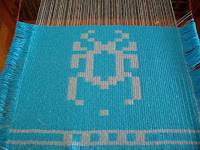 Actually, this time I wove both a male and a female beetle on the same piece. The male is bigger and has horns. You can see the male starting to be wound around the front beam in the photo. I couldn't get a good shot from the top of the loom due to the significant [perhaps excessive?] amount of metallic yarn and the various lights in my studio. The bright blue piece in the front is one of my experiments with optical illusions in fiber. You are seeing the backside of a distorted checkerboard pattern. I am seeing what kind of optical illusions can transfer successfully from paper to fiber. Between each beetle I do a little experiment in optical illusions. I am making them the size of the opening in the framed greeting cards so I can later use them for that purpose. Alternating between these two completely different projects keeps my creative juices flowing. Not much blogging...but lots of progress on the table looms...a new warp, a half a beetle and a full beetle. I find it quite amazing I can listen to a continuing education web cast on financial planning while taking an occasional note plus weave. This four harness twill stuff is amazing! I can entirely focus on something else while weaving this simple twill pattern. I guess it's like people knitting while they watch TV. 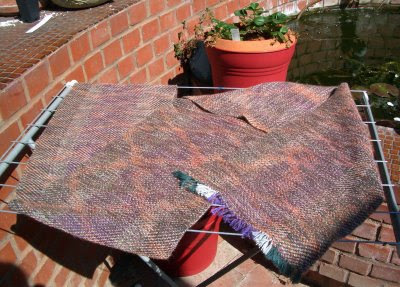 Here's a bit over 2 yards completed, wet finished and drying outside. Looks and feels yummy. 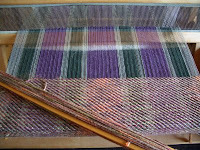 Plan to put more warp on...I have a hours and hours of continuing education to complete this year. I figure by the time I have my hours, I should have enough material to piece together a jacket...or something. I forgot how delightful it is to weave something that does not require thought. I picked up an eight harness table loom yesterday from a weaver who had passed away. I had warped the loom for her several years ago in a four harness twill. The entire warp, of unknown length, had not been touched. I decided to weave off the warp. 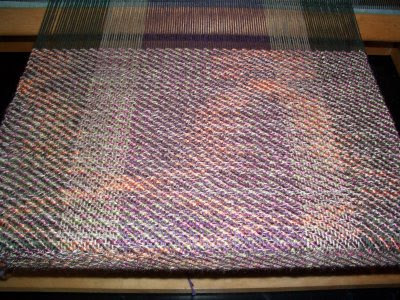 The warp colors were pleasant and I had a variegated weft yarn that worked wonderfully with the stripes in the warp. I could have just cut off the warp but I am so happy I didn't. It truly is delightful to simply weave. No thought required. No looking at grids to figure out what harnesses to raise. 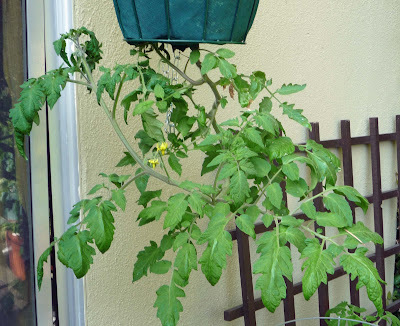 No worrying about color changes. No sticky spools or bobbins. Simply thick variegated yarn on a stick shuttle and a four combination pattern requiring no memorization. I can go more than a foot before refilling my shuttle. It's fascinating I can actually think about other stuff while I weave and not make mistakes. When my mind wanders while doing taquete I always make mistakes. 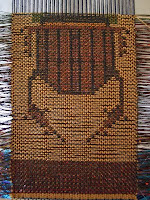 If my mind wanders when I weave tapestry, I generally stop weaving. I could actually listen to a book on tape weaving this way. Wow, what a different weaving lifestyle. Kinda like being on vacation from work. There is always great excitement at the discovery of a novel concept. Right after writing that blog entry I went and warped my loom with seven yards...yes seven yards of bamboo with a basic twill set up. My idea was to weave fabric to make a jacket for a wedding I was going to. I wove one inch of tabby and one inch of an undulating twill then stopped. I have not touched that loom in over a year except to move it to three different positions in our living room. Needless to say, the wedding came and went. I just could not imagine myself weaving seven yards of undulating twill. Or at least I think it was seven yards...I have yet to find my notes on this project. Now I have an idea to accomplish many things. Actually weave the warp on the loom instead of cutting it off. Create another something to submit for the yardage exhibit in Convergence next year...I have always wanted to submit more than one piece. And much later have completed both a novel and a jacket. 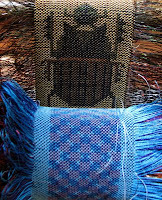 Yes, I am quite excited to be figuring out how to structure both a weaving and a mystery to tell the same story. So cool, one story but two mediums with two different results. The same story in words and weft.